The metaphorical and symbolic presentation of depicted neteru (gods, goddesses) on the Egyptian monuments and documents was unanimously acknowledged by all early writers on the subject, such as Plutarch, Diodorus, Plotinus, Clement, etc. A symbol, by definition, is not what it represents, but what it stands for, what it suggests. A symbol reveals to the mind a reality other than itself. Words convey information; symbols evoke understanding.The example shown below is a perfect representation of the Enlightened Heart. Each pictorial symbol is worth a thousand words—representing that function or principle, on all levels simultaneously—from the simplest, most obvious physical manifestation of that function to the most abstract and metaphysical. This symbolic language represents a wealth of physical, physiological, psychological and spiritual data in the presented symbols. 2. How do Egyptian Depictions Reflect Metaphysical Concepts? 3. Accessories, Emblems, color, etc. So many phrases are being used throughout the world which consistently state that the human being is made in the image of God (i.e. a miniature universe); and that to understand the universe is to understand oneself, and vice versa. Yet, no culture has ever practiced the above principle like the Ancient Egyptians. Central to their complete understanding of the universe was the knowledge that man was made in the image of God and, as such, man represented the image of all creation. Consistent with such thinking, a depicted human being represents both the universe as a whole as well as the human being on Earth. According to Egyptian philosophy, though all creation is spiritual in origin, man is born mortal but contains within himself the seed of the divine. His purpose in this life is to nourish that seed, and his reward, if successful, is eternal life, where he will reunite with his divine origin. 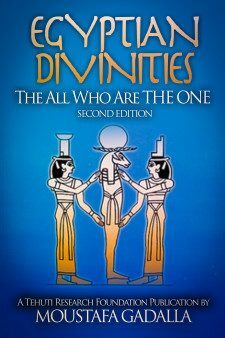 Egyptian artwork clearly depicted the earthly man and the progression to ultimately become one with the Divine. Egyptian figuration carefully marks—with a headband, crown, diadem, or joint—a dividing line for the top of the skull of the earthly man, thus separating the crown of the skull. The height of the body was measured exclusive of the crown. The illustrations show the earthly man as always higher than the divine aspects. The horizontal line between the blocks of Abydos Temple below shows us clearly that this is an earthly man — with his crown above those of the deities behind him — in the process of self-development. The difference in the height between the two realms reflects the Ancient Egyptian deep understanding of the physiology and role of humans on earth. The removal of this part of the human brain leaves man alive, but without discernment – hence, with no personal judgment. The person is in a vegetated state; i.e. living and acting only as the executant of an impulse that he receives, without actual choice. It is like a person in a coma. The earthly being must use his cerebral instrument to choose his actions. These actions will be in agreement or at variance with natural harmony. If, during his/her earthly life, the actions are not harmonious with nature, s/he will reincarnate again to the earthly realm, to try another time. The Egyptians’ careful observation and profound knowledge of the natural world enabled them to identify certain animals with specific qualities that could symbolize certain divine functions and principles in a particularly pure and striking fashion. As such, certain animals were chosen as symbols for that particular aspect of divinity. This effective mode of expression is consistent with all cultures. For example, in the West they use expressions such as: quiet as a mouse, sly like a fox, etc. When we talk about loyalty, there is no better way to express loyalty than a dog. When we talk about the protective aspect of motherhood, there is no better way to express it than a lioness. This symbolic expression of deep spiritual understanding was presented in three main forms. 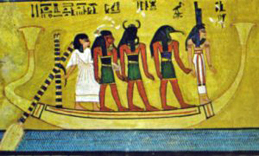 The first and second are animal-headed humans or a pure animal form, as we see below in an example for the dog Anubis. The animal or animal-headed neteru (gods/goddesses) are symbolic expressions of a deep spiritual understanding. When a total animal is depicted in Ancient Egypt, it represents a particular function/attribute in its purest form. When an animal-headed figure is depicted, it conveys that particular function/attribute in the human being. The two forms of Anubis, in the two illustrations shown here, clearly distinguish these two aspects. The third form is the opposite of an animal-headed human. In this case, we have a human-headed bird—that is, the Ba—representing the body’s soul, hovering over the body. 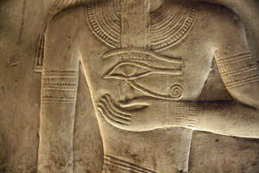 The depiction of the Ba then is the divine aspect of the terrestrial. 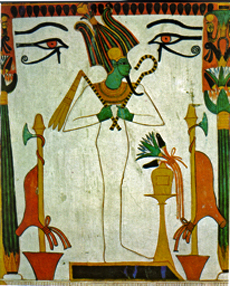 The Ba is depicted as a stork. The stork is known for its migrating and homing instinct, and is also known worldwide as the bird that carries newborn babies to their new families. The stork returns to its own nest with consistent precision—hence, a migratory bird is the perfect choice to represent the soul. In Egyptian symbolism, the precise role of the neteru (gods/goddesses) is revealed in many ways: by dress, headdress, crown, feather, animal, plant, color, position, size, gesture, sacred object (e.g., flail, scepter, staff, ankh), etc. This symbolic language represents a wealth of physical, physiological, psychological and spiritual data in the presented symbols. A headdress identifies the deity and its particular function or functions. The depiction below of a seat identifies Isis as the legitimate source of authority. 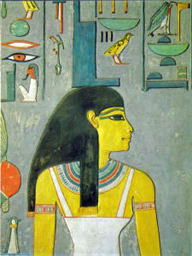 Maat is identified by the feather of truth mounted on her head. Several other examples are shown throughout this book. 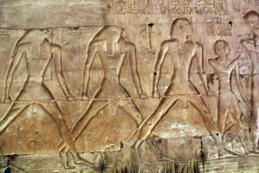 Practically all figures on the walls of Egyptian monuments are in profile form, indicative of action and interaction between the various symbolic figures. A wide variety of actions are evident in the forms. 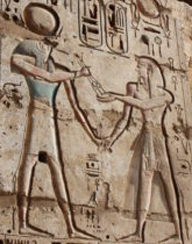 The pictorial depiction both in hieroglyphs and figurative images are presented in animated, precise, active modes. The Egyptians proportioned the pictorial figures, as well as the hieroglyphs, by the application of generative dynamic design [more details in Ancient Egyptian Metaphysical Architecture by Moustafa Gadalla].